It was a full day at Off The Grid's Picnic in the Presidio and after stuffing ourselves full of meat what better way to finish off than with something warm and sweet. The dessert offerings where on the slim-ish side but there was one that stood out to both me and the SO, offering up deep fried delight--Girl Friday Zeppole. I mean seriously, like I'm gonna pass up deep fried dough--with sugar! They make both original sweet and savory, which we'll just save for another time. 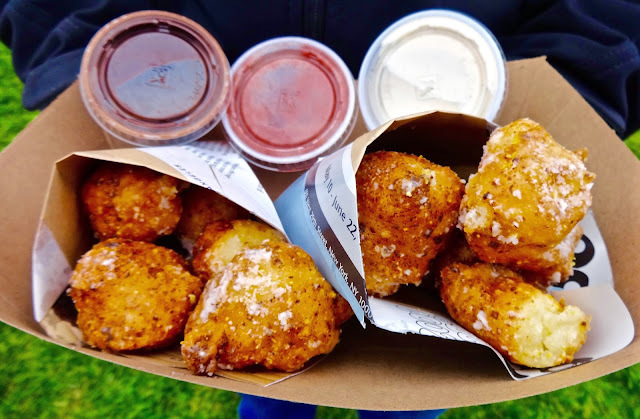 For $10 you can get a dozen with 3 dipping sauces, which is exactly what we got. Zeppole's are Italian doughnuts. These particular ones are made with flour, ricotta and polenta then dusted with powdered sugar and lemon zest. They are made to order thus are served warm and crispy on the outside and soft on the inside. Biting into them is like having a creamy cloud of sweetness and all the flavors of the zest and ricotta shine through making these light but still filling. The polenta gives it a little more texture that makes it border close to creamy hush puppy. I was okay with that and liked it a lot. The three sauces we got were vanilla bean creme fraiche--tasty and light and the best of the three as far as mixing well with the flavors of the zeppole. Earl grey chocolate ganache--yeah, good but all we could taste was the chocolate, if there was tea in here, it was overwhelmed by the chocolate. We liked it but I'm not a personal fan of lemon and chocolate so this would come down to ones personal flavor profile likes. Finally was a strawberry rhubarb--it was kind of like a compote and honestly not very interesting. Neither I nor the SO was a fan of it and we didn't have more than a bite of it. I might have preferred a caramel in place of this one. Our choice then is the creme fraiche or 2 cremes and a chocolate if you get the 12 pack. Girl Friday Zeppole really hit the sweet spot, as it were, for both me and the SO. Luscious, creamy, deep fried dough with flavor to spare whether you eat it with a dipping sauce or not. These little balls of delight had the heft that I look for in my desserts and the price was a good bargain for the amount and size of the ones you get. 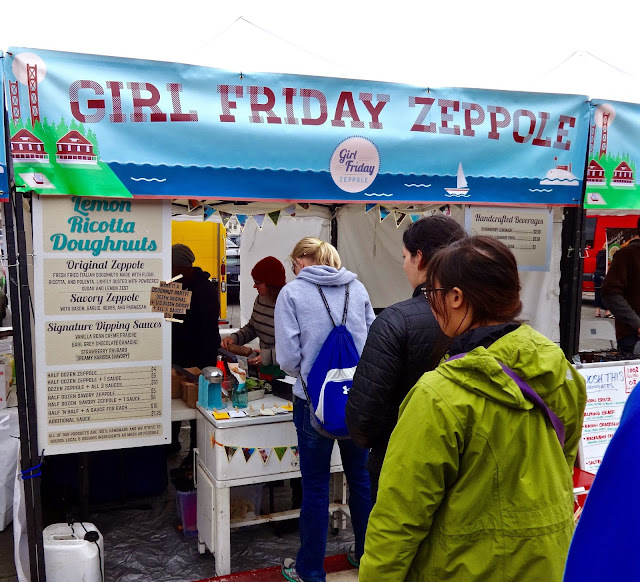 If you come across Girl Friday, get some zeppoles, you'll be glad you did.